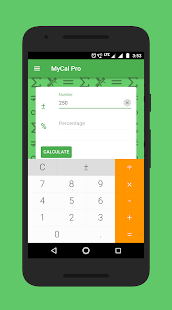 MyCal Pro - Percentage & General Calculator is just the best and easiest to use app which calculates percentage as well as general calculations. It is unique in a manner that it calculates everything on the fly. It have inbuilt calculator which seamlessly combines with percentage calculator user interface.